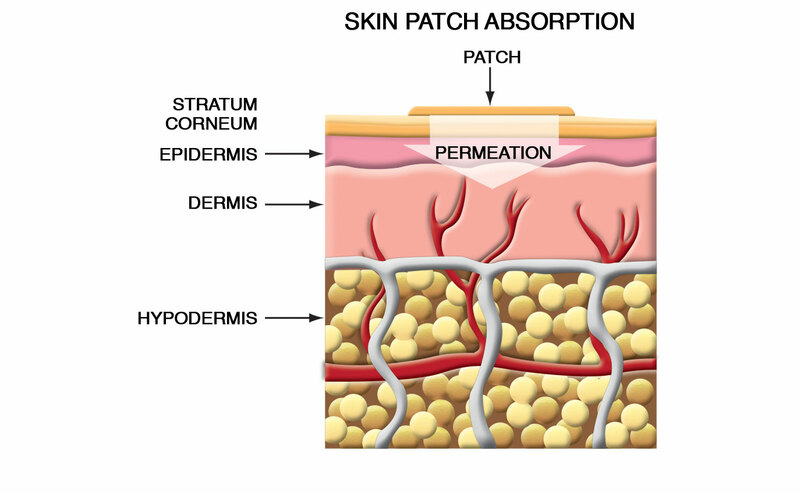 What is a transdermal patch and how does it work? The patch technology is composed of flexible multi-layered polymeric laminates and reservoir system which uniquely isolates the most active and potent ingredients that are infused into the substrate of matrix of the patch. The Timed Release of the Re-Med Patch represents a new generation of patch technology that combines superior bioavailability and excellent absorption rates with the highest effective levels of key nutritional supplements. A key to the importance of a nutritional supplement is its bioavailability: the rate at which it enters the bloodstream and is circulated to the body’s organs or tissues. Studies have indicated that many products have greater benefits when used over the course of the day and not taken in one dose. The Timed Release of the Re-Med Patch releases its ingredients over a 3 to 6 hour time period. The Timed Release of the Re-Med Patch is different from any other topical patches, because it utilizes patent pending Timed Release Technology that results in the ability to allow more types of ingredients to permeate (penetrate) through the skin than other competitor patch. Why does Re-Medical use full spectrum phytonutrient extracts? Plants have numerous active compounds and a host of other phytochemicals that serve as buffering, stabilizing, or modifying agents. Much remains to be understood in terms of the exact mechanisms, complex interactions, and synergy that naturally occurs between plant compounds. Isolating single plant constituents ignores the intelligence of a plant's chemistry. Utilizing the whole plant, with its full spectrum of plant constituents, has repeatedly been shown to impart greater biological activity and safety. Cannabidiol (CBD) is non-psychoactive and has many effects on cannabinoid receptors throughout the body, reducing spasms, decreasing inflammation, and regulating electrical impulses throughout the nervous system which also contributes to overall pain relief. Delta-9-tetrahydracannabinol (D9-THC) can be psychoactive in higher concentrations, producing effects of euphoria, and time distortion. Even at low doses, however, THC can increase the urge to eat, as well as work with CBD to reduce pain, nausea, and muscle spasms. Cannabis Indica often has a higher percentage of CBD than Cannabis Sativa. By contrast, Cannabis Sativa often has more THC than Cannabis Indica. Which Re-Medical Topical Patch should I use? For purely non-psychoactive effects, the Remedy Topical Patch is recommended. The Panacea, Mellow, and Elevation Topical Patches have higher concentrations of THC that can result in drowsiness, excessive relaxation, and a general sense of euphoria that may not be desired by all consumers. Only the Remedy Topical Patch has been recommended for use by children and others under the age of 18 in legal jurisdictions. It should be noted that CBD-rich remedies with little THC don’t work for everyone. Parents of epileptic children have found that adding some THC helps with seizure control in many instances. For some epileptics, THC-dominant strains are more effective than CBD-rich products. Physicians and patients are finding that different ratios of CBD and THC are optimal for different conditions and individuals. A CBD-rich strain or product with little THC is not necessarily a superior treatment option compared to a balanced CBD-rich remedy with an equal amount of CBD and THC. A CBD-rich extract or strain with little THC might be optimal for treating anxiety and many seizure disorders, whereas pain syndromes, cancers, and neurodegenerative conditions could benefit from an appropriate amount of THC. One size doesn’t fit all with respect to cannabis therapeutics, and neither does one compound or one product or one strain. How do I use the Re-Med Patch? Choose a clean, dry, hairless area on your upper body to apply the patch. Peel off one new patch each day and apply to upper arm, shoulder, or back area, adhesive side down. Leave the patch in place for 3 to 6 hours a day as directed on the packaging. Drink at least eight, 8 ounce size glasses of good quality water each day. This will help flush out toxins from your body and replace essential fluids. Do I have to wear the Re-Med Patch on a certain part of my body? Absolutely not. However, the Re-Med Patch is not recommended to be applied to your face, head or in the genital area. Applying a Re-Med Patch to any part of the body with excessive hair will restrict absorption. The Patch must be in contact with the skin to ensure the ingredients are being absorbed. What are the advantages of topical patches over pills? Doctors, parents and loved ones around the world are calling topical patches 'the delivery system of the future'. It has been discovered that a high absorption rate of many supplements can be achieved when delivered through the skin. Delivery through the skin is the quickest as the ingredients will begin to circulate immediately. Advanced technology is used to ensure each patch holds a higher concentration of the active ingredients, holding four times more active ingredient than other competitors. Their 3-6 hour timed release technology ensures that the active ingredients are released at a consistent rate over a period of time, which is why topical patches work so well. Are Topical Patches safe to use? Topical patches are very safe; they contain no harmful chemicals such as aspirin, acetaminophen, caffeine or ephedrine; and they are made of all-natural, quality ingredients. When can I use a patch? Topical Patches can be used anytime and anywhere. They don't require water and can be used at virtually any location. Patches are especially ideal for people who have difficulty swallowing pills or do not like the taste of like the taste of liquid vitamins. Can everyone use Topical Patches? Yes, any healthy person can use a Topical Patch per the directions. If you are pregnant, nursing or have any serious health conditions, you should consult a physician or health care professional before using topical patches or any other nutritional supplements. If you are uncertain if you should use this product, please do not buy it or try it. No, Re-Med Patches are not waterproof. If a patch gets wet, remove it and apply a new one. Are there any side effects to wearing a Re-Med Patch? Re-Med Patches have not been shown to have any serious side effects. If you are pregnant, nursing or have any serious health conditions, please consult a physician or health care professional before using this product. In addition, please read the ingredients of the patch you are considering and DO NOT use the Re-Med Patch if you are allergic to any of the specified nutritional supplements or ingredients. Can I use more than one patch at a time? It is not recommended to use two Re-Med Patches at any given time. The recommended dosage is one patch per 3-6 hour period depending on the directions found on the box. There is no increased nutritional benefit or level of effectiveness for using multiple patches. How to store the Re-Med Patches? Re-Med Patches should be stored at room temperature, away from any source of heat, moisture or direct sunlight. Additionally, keep Re-Med Patches out of the reach of children and away from pets. Please refer to the expiration date on the Re-Med box for guaranteed freshness and usability. Does chronic use of THC impair IQ? This oft-repeated tale is based on a single study (later repudiated in the same journal) that failed to establish a causal link between juvenile marijuana smoking and lower IQ. Scientists have identified many factors that contribute to impaired IQ, and cannabis isn’t one of them. A junk food diet lowers IQ and damages memory. Children who regularly skip breakfast, often kids that are impoverished, have lower IQs than other children. Does THC cause brain damage? A 2012 study published in the journal Alcoholism: Clinical & Experimental Research, found that a teenager who consumes alcohol is likely to have reduced brain tissue health, but teen marijuana use shows no effect on brain tissue. Can I cut a Re-Med Patch? No, this is not recommended. If our patch is altered in any way, the membrane controlling the delivery of the herbals, then the delivery will be highly unpredictable. Can I wear my Re-Med Patch over a tattoo? We suggest wearing our patch on part of your body that is not tattooed. It is unknown whether the tattoo would affect how the patch would work, or if the tattoo coloring would change. If you have a skin disease, rashes, or allergies to adhesives, check with your doctor before using our patch. If a skin rash develops, or if the skin under the patch become swollen or very red, stop using our patch and see your doctor. Why aren’t my patches sticking? Lack of adhesion may be attributed to hot weather, your skin type and certain activities. Please be sure you have your patch applied properly: choose a non-hairy, clean, dry area of skin. Press the patch firmly on your skin with the heel of your hand for fifteen seconds. Make sure it sticks well to your skin, especially around the edges of the patch. Do not sure moisturizing soap or lotion prior to application of the patch. When should Re-Med patches NOT be used? Our products should not be used if your skin has a wound or is damaged. Do not use with a heating pad. Do not use when sweating. Do not use on your face. Do not use over a rash. Do not use if you are pregnant. Do not use if using multiple medicines. Can Re-Med patches be taken along other products? Yes, but a doctor should be consulted first and it is important to read product labels carefully. Only ever use one Re-Med patch at a time. Can children use Re-Med patches? All Re-Medical products can be used for children twelve (12) years old and over unless otherwise stated. Parents should speak with a pediatrician before applying any patch to their child. What are the possible side effects of a Re-Medical patch? Constipation, Nausea, Sleepiness, Vomiting, Tiredness, Headache, Dizziness, Itching, Redness or rash where the patch is applied. Call your healthcare provider if you have any of these symptoms and they are severe.